Volgograd Stadium is a football ground located in Volgograd city of Russian Federation. Volgograd is a large city of Russia having 1 million population. This stadium is a newly built ground specifically for 2018 FIFA world cup. Construction of the stadium was started in 2015 and it was completed in this year (2018). This stadium was built on the banks of Volga river where the central stadium was located. The central stadium was demolished in 2014 and this new Volgograd Arena was built on the same location. 2018 FIFA world cup tickets for Volgograd stadium is in high demand as this stadium is going to host 4 round matches of soccer world cup. Stadium is also known as Volgograd Arena and it named on the city. Stadium capacity is 45000 and it is one of the biggest stadium of the region. Capacity of the stadium might be downgraded to 35000 after the soccer world cup. Apart from Russia football world cup, this stadium will be useful for other sporting and cultural events of the country. The stadium architecture as per the city theme. It is around 4 KM from the main city centre of Volgograd city. In this post, we will cover the information related to FIFA 2018 world cup tickets, nearest airport, how to reach, nearby hotels, schedule and how to reach. Below are some quick facts related to Russia Volgograd Arena football stadium. Tickets for Volgograd arena world cup are already on sale through multiple websites. Fifa comes after every four years and this is a grand opportunity for every football fans to watch their football starts live playing for their team. The first match of soccer world cup will be played here on 18, June 2018. Last match scheduled here on 28 June 2018. Always buy FIFA tickets only from authorized websites and save yourself from potential fraud. Most of the details related to the world cup are easily available on official website. 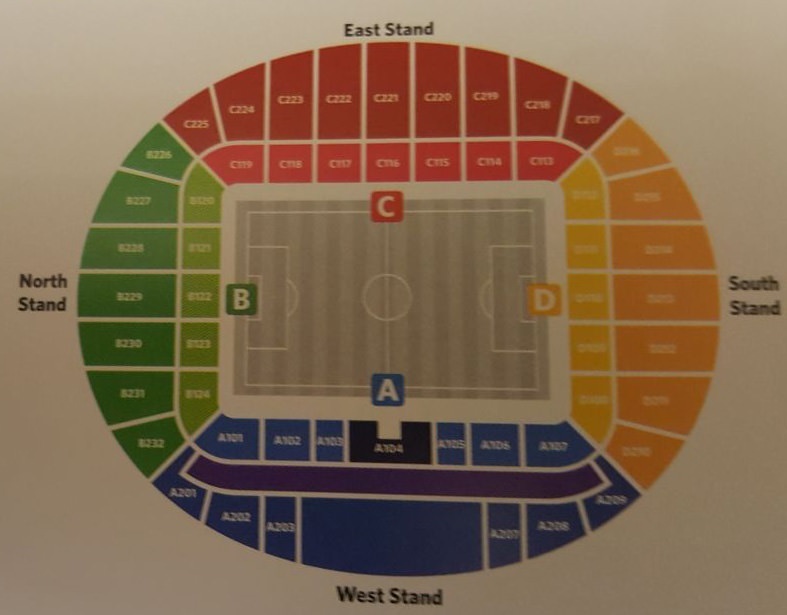 Volgograd stadium ticket prices depend on match type, day, teams and seat category. Always check the prices and other before making a payment. Finding a seat in a big event is a very tough task, especially during the FIFA world cup on a 45 thousand capacity stadium. This stadium is a huge one and newly built, so many people are not aware of the seating plan of Volgograd Arena. We have attached an image of this stadium so that visitors can locate their seat easily from below seat map. This will be useful during the entry and exit from the stadium along at the time of online bookings. It is around 4 KM far from city center of Volgograd. Many hotels of all budget range are available in the vicinity. The hotels ranges from cheap to higher budgets. Stay near the stadium is not a problem and variety of hotels are located nearby. Below is the list of randomly selected hotels near the Volgograd Arena. It is located near the main city. High-speed tram, railway and other modes of public transport connect this stadium from other locations of the city. Address of stadium is 76, Volgograd, Volgogradskaya Oblast’, Russia. Volgograd International Airport is the nearest airport to the venue and renovation is in full pace due to Russia soccer world cup. It is around 23 KM far from the ground. Some modes of public transport are available from the airport to the ground and it includes an interchange. A taxi will take approx 30 minutes from the airport to the venue as per normal traffic.